This story is a follow on from the British Standard Fire Test of an earlier post. It is the story of how an attempt to be innovative with design in the aftermath of a major natural disaster foundered on the rocks of tick-box regulation. Satellite image of Chelmer on the Brisbane River in January 2011. Source; ABC/Nearmap. In the aftermath 38 people were confirmed dead and 6 more listed as missing. The greatest losses of life occurred in Toowoomba, Ipswich and the Lockyer Valley. Brisbane, the state capital and third largest city in Australia was severely impacted with official flood peaks of 4.46m in the Brisbane River. The estimated damage bill was around $A2.4 billion. That summer (the southern hemisphere has summer from December to February) I had just completed designs for two houses in the Brisbane suburb of Chelmer. My clients owned a vacant 800 square metre parcel of land on a corner site. Brisbane planning regulations allow such a site to be sub-divided into two, in this case 10 metre by 40 metre “small lots”, upon each of which a family home can be constructed. We knew the land was low-lying with an “overland flow” path across part of it. Accordingly the design approach involved a raised structure for the lower level with another level above. The idea of the raised structure is to avoid inhibiting the overland flow, so that damming does not result. The overland flow we were responding to was that resulting from sudden intense storms that are commonplace in Brisbane (and many other parts of Australia). Such storms can produce an intensity equivalent to hundreds of millimetres of rain in less than an hour. The run-off from such intense rainfall quickly overwhelms the stormwater drainage system and begins to travel over land. Unlike river flooding, overland flow comes and goes very quickly. Typically the storm will pass in under half an hour and the water soon makes its way into creeks and the river. Overland flow, or “flash flooding”, can be extremely dangerous, particularly around open stormwater drains and drainage inlets. In our case the predicted overland flow was up to 0.2 metres in depth with a fairly low velocity. Fast flowing water less than knee deep can sweep you off your feet and carry you away. The risk of serious injury or death is significant. We ultimately engaged hydraulics consultants to model the catchment and confirm the applicable depth/flow parameters for this site – more on that later. The designs I had proposed for my clients were fairly conventional “small lot” detached houses slightly adapted to the local overland flow conditions. We had lodged the designs for building consent approval in December 2010 but were yet to appoint a builder, so no work had commenced when the floods came in January 2011. Had we been more advanced with programme and construction had commenced, the houses would have been inundated up to near the upper level window sills. In terms of water depth on this site, that was approaching 5 metres! The house next door, similar in overall concept to our proposals, had flood water lapping near the upper window sills. Post-flood, my clients were faced with a major dilemma. Whilst there was no property damage to physical infrastructure (on this site) caused by the flood, the land value was significantly diminished and hence the overall project feasibility was now questionable. What would a new house in a known flood affected location be worth? My clients had hoped to live in one and sell one to help reduce their mortgage but those plans fell away with the land valuation. The only realistic way forward was to proceed with development that addressed the flood question, as was the case with a large number of other properties in flood affected areas. The Brisbane City Council introduced special planning relief on overall building height to allow people to raise houses above the flood level. Indeed before the flood of 2011 there was a forecast flood level allocated to all land in the Brisbane greater urban area. We had researched the “flood immunity” level required for these designs in 2010 and complied with them. It turns out that these immunity levels were exceeded by up to 1 metre in some cases. On this site we estimate the actual flood level was 0.9m above the defined flood level. Raising our existing designs by a metre was technically feasible but aesthetically questionable. The outcome would have obviously been a “flood house” for evermore. Such houses are indeed evident now, three years on. They are disproportionately tall and awkward. They will be a constant reminder that this land is flood land. We wanted to strive for a different outcome, to use this situation as a springboard for a new form of house design with greater resilience, to create something exciting, not simply jacked up old thinking. Our total land parcel was 20 metres by 40. Initially we proposed two 10 by 40 lots, but for our post-flood ambitions these were going to be difficult to deal with. Since we had a corner site there was an option to sub-divide two 20 by 20 parcels, which would allow us to achieve tall houses that were reasonably proportioned. The resultant designs came to be known as “the tree house” and “the boat house” because in a flood it might be handy to have a tree or a boat! Both designs had the same basic organisation. The lowest level, which is guaranteed to flood under the same conditions, provides off-street car parking and a front door. The detailing of this level is such that following a river flood it can be hosed clean and will self-dry without damage to the structure or finishes. It is important to mention here that the river flooding in this area has no significant flow. The river backs up and the waters rise, but they are not sweeping along putting structures under load or smashing debris into the building envelope. With the lowest level set at about 0.5m above natural ground and designed for quick recovery at low cost, the next level above, which is also at risk of inundation if waters exceed about 3 metres in depth, is used as a large alfresco living space. This level is enclosed with single skin walls of corrugated metal, cement sheet and marine ply. There are no cavities to collect silt, but there are also no cavities for insulation or concealing services. We treated this level as if it were a giant verandah or ‘deck’ which are popular in Brisbane’s benign climate. People here love outdoor living and most houses have generous patios, decks or verandah spaces that become the focus of entertaining and relaxing for much of the year. Above the middle alfresco level we arranged the bedrooms and bathrooms. This top level is well above the 2011 flood, by a couple of metres. Because of this we proposed a well-insulated, well-sealed space that could be efficiently conditioned during the extremes of summer and winter. This level is also a refuge for personal possessions if the house needs to be evacuated. River flooding is unlikely to strike without warning. People will not be caught unawares or in their sleep by a sudden flood, so there will be time to prepare the house and move out to a place of safety. Being able to move precious possessions to the security of the uppermost level before evacuating is one of the principles of resilience that underpin these designs. The way these houses are serviced also includes some unique features. Rooftop solar panels with battery storage maintain critical circuits on the top level. A refrigerator, basic lighting, and communications connections will not power down when the mains supply is cut. This means that food will not spoil, and interactive monitoring can occur allowing the owner to check on conditions within the home (subject to network availability) even if they are unable to go there in person. The electrical circuits in the house are structured such that each level can be isolated until safety check are completed, or if hosing out silt after inundation. A kitchen and bathroom are located on the alfresco level, because for the vast majority of the time this will be the primary living space for the occupants. The fit-out for the kitchen comprises metal framed portable storage units with containers that can be quickly relocated or used for transporting their contents. Plumbing fixtures are located on walls where the back face can be unscrewed for access and cleaning out. Finishes are selected from a limited palette that will withstand temporary immersion. The objective is to reduce the cost and time required to restore the house to liveable condition after a flood. The lowest level is car parking and entry, the middle level is alfresco living and the top level is a flood-safe refuge for possessions – and bedrooms. These designs were up to 11.5m high when the normal limit is 8.5m and the special post-flood dispensation allowed 9.5m, but neither the Council nor the neighbours had any objections to the height (or the design in general). What stopped this project in its tracks was 200mm of water over the road. When we were proposing 10 by 40 lots, the street frontage became the side street, but with the 20 by 20 lots street frontage became the main road, which has a dip at the point where overland flow occurs. This overland flow path passes through one of the two 20 x 20 lots and means that we could not provide “flood free” access to the “new” site. The side street is higher and not subject to overland flow, so two lots each with an overland flow path across them was acceptable, but two lots configured differently meant that one of the lots might occasionally have up to 200mm of water in the driveway for half an hour at most. This was unacceptable to Council – never mind that the whole of the site has been 5 metres under, that was no barrier to approval – but 0.2m from time to time, not acceptable! Hydraulic engineers were appointed to do the modelling on the overland flow, which was in fact only a theoretical possibility that no neighbour has actually seen happen in living memory. The modelling predicted up to 0.2m of water flowing at less than 1.0m per second with a likely duration of between 5 and 10 minutes if we have a rainfall intensity equivalent to 275mm per hour. Council policy is that all “new” land must have flood free access, including overland flow. The suburb of Chelmer is on the Brisbane River flood plain, has been occupied for decades and has seen several major floods. Council was not going to stop people living there for political reasons – they would also have triggered a huge legal battle over compensation for freehold land owners too. The land in question was only “new” because we were rearranging the boundaries. 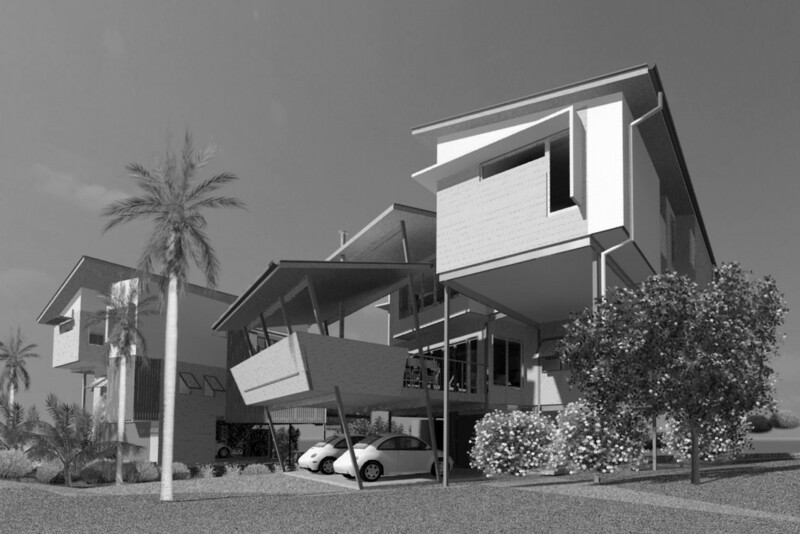 My client did not have the heart, nor the pocket, for a fight with Council so the tree house and boat house concepts were shelved and we went back to the 10 x 40 scenarios with jacked up floor levels. In the end five metres of inundation didn’t thwart us, 200 millimetres did. Just like the British Standard Fire Test, the process of evaluation upon which progress depended was blinkered and inflexible. We might have achieved some innovative solutions and injected some novel ideas into the public realm if there had been room in the approval process for the exercise of judgement. Is a better solution for a 5 metre city-wide inundation more significant than the lack of a solution for a 0.2 metre local event? In this case, apparently not. Increase overall building height to provide habitable space at a level higher than the January 2011 flood benchmark. This allowed for a flood refuge within the house design as a place to move valuable possessions to ahead of a flood as well as a suitable place for early reoccupation during the clean-up process. Increase boundary set back distances commensurate with proposed greater height to maintain amenity for neighbours. Key to this was reconfiguring the lots, two into two, to achieve 20 x 20 metre sites rather than the 10 x 40 metre traditional format. Utilisation of flood tolerant construction, materials selection and detailing in the inundation zone to facilitate rapid and low-cost recovery with minimal need for replacement of building fabric, fixtures and fittings. Household functional zones configured according to inundation risk, including ease of relocation of furniture and equipment to upper levels during a flood episode. Part of this configuration includes separation of electrical circuits such that each level of the dwelling can be electrically isolated from the whole allowing non-flood affected levels to be safely re-energised early in a post-flood period. A critical assumption is that ample warning will occur for major flooding events allowing residents to make preparations, relocate valuables, secure the premises and evacuate to a place of safety. Establishment of community based flood (and natural disaster) action/response plans; including identification of escape routes and designated safe refuges, will be an important adjunct to individual design responses such as proposed here. This entry was posted in Thoughts, ideas, musing and tagged architecture, Australia, climate change, design, resilience, sustainability. Bookmark the permalink.